My goal for June was to finish 16 hexie flowers. That's a lot less that what we need to follow the Stitch-Along but to be honest, I didn't think that I could even do 16. 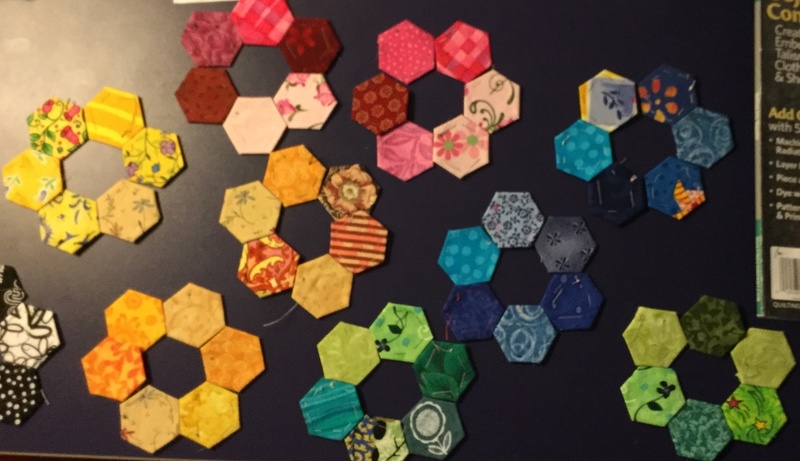 Thanks to Miaismine's very positive comment, I figured out that from the date she left me the comment, that if I did roughly one hexie a day, that I could easily complete all 16. So that's what I did. 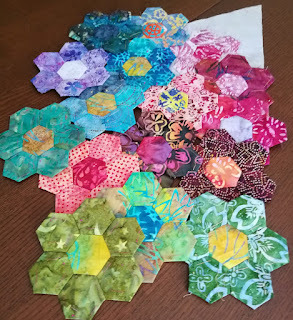 I even took some hexies to work and basted them on my lunch break! 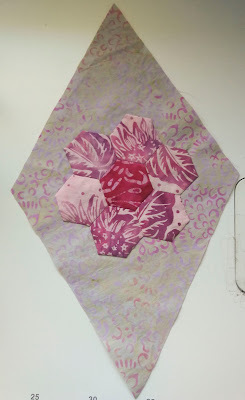 I also finished hand-appliquéing my first hexie to my background. I really like how it looks. This project is going to be a LOT of work. Oh well, it will get done eventually. The first 16 hexie flowers completed! I chose to make Block 2 which includes off-set curves within curves. To give it a starry look, I used an orange fabric for the centre, then bright yellow and a lighter yellow to symbolize a fiery star. Of course my son then told me that stars are only one colour because that's how they categorize them. Oh well, the artist in me doesn't care 😊, except that I messed it up, which I do care about, but at time, not enough to make another one! If you haven't figured it out, you'll have to read what I learned below. 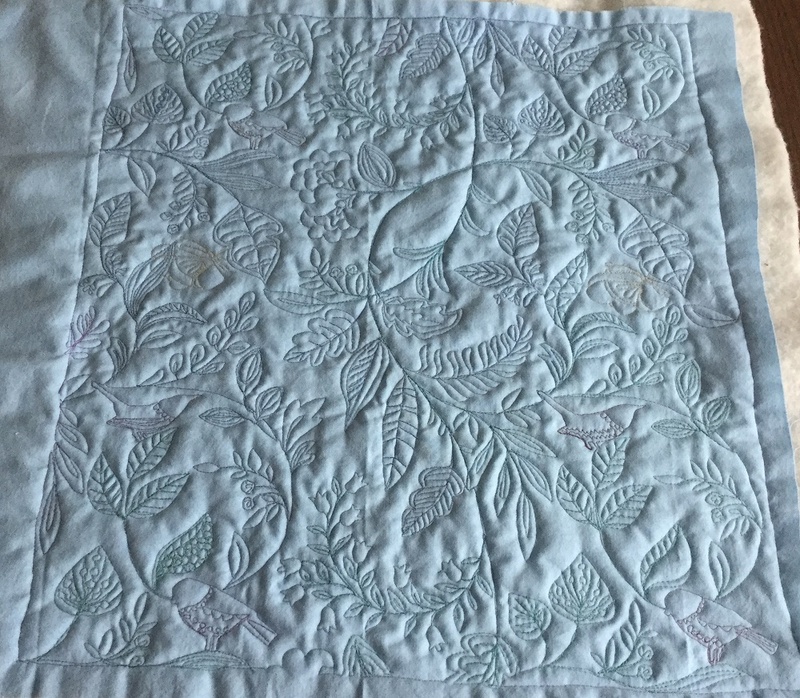 I was doing well quilting Angela Walters' Feather Meander until I ran out of thread. So Wendy go me two spools of Kimono silk thread from Superior Threads. One spool of 345 (Kyoto) and one of 317 (Orenji). Looks like I'll be back at it. Yeah! This is my To-Do Tuesday project for the week! 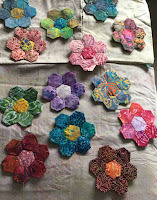 Although I've completed my 16 hexie flowers, I'm not going to be making the next 16 my July OMG. As much as I love making them, I would rather take my time and not have to rush. I am happiest without deadlines! 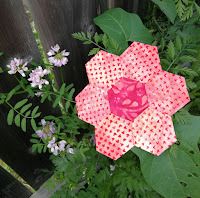 I also enjoyed hand-appliquéing the hexie flower onto the diamond fabric. It is a rather slow stitching Sunday type of task and is going to take a while. It will be a gorgeous quilt though. 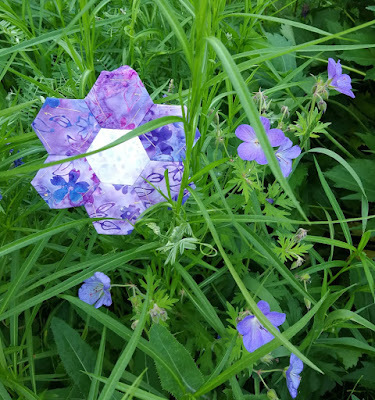 I was also reminded, while I was appliquéing my hexie flower to my diamond, that I should have ironed (and possibly starched) it, before starting. 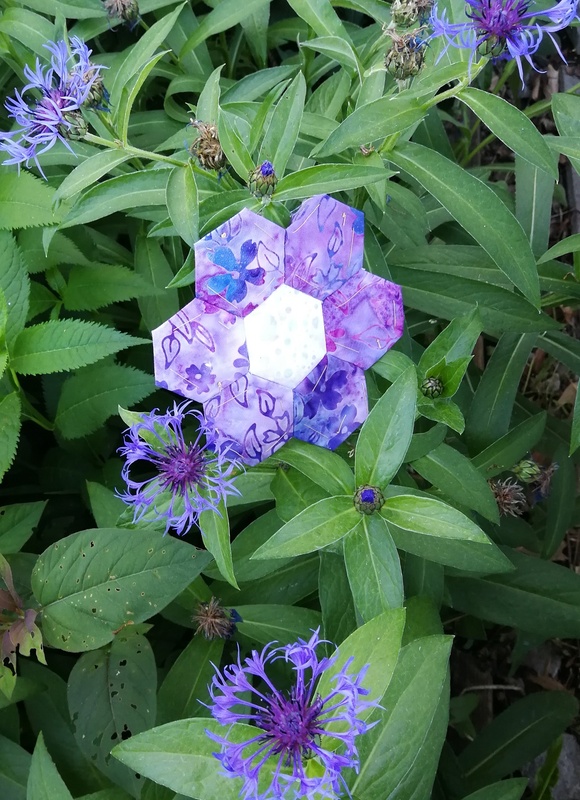 I've added a few pictures of my hexie flowers to my post since it was nice enough outside to take pictures. I must admit though that sewing these curves was a lot easier than I expected. Alida suggested that we not bother pinning the pieces since they were wonky anyway. Wow, that was really wonderful and easy to do! If I end up making a new block, I'll post it here as an addendum. 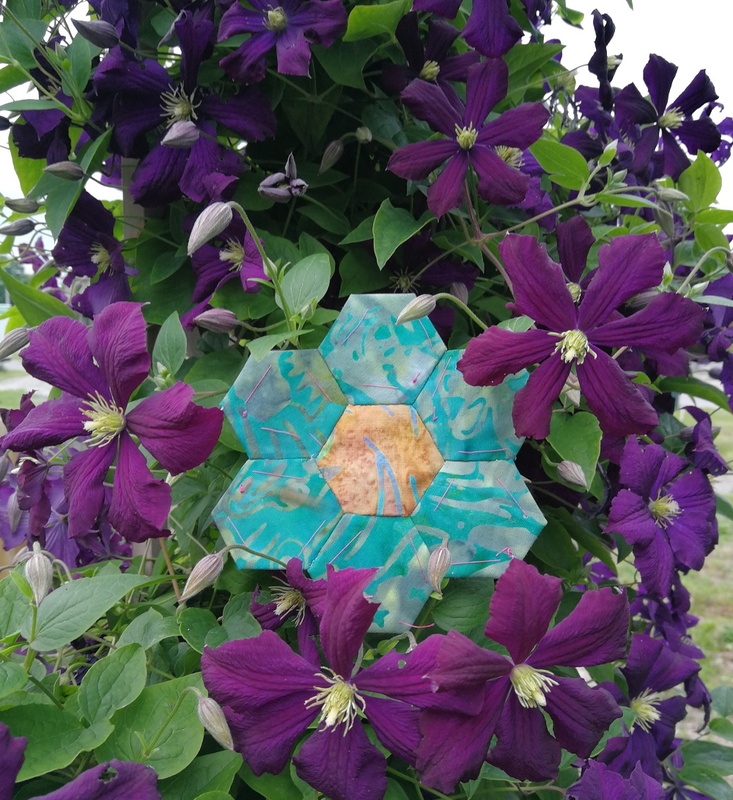 I will be linking this post to both the One Monthly Goal - June Finish Link-up and the Starry Bright Night link-up. 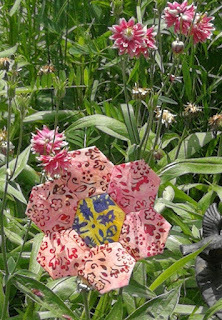 Can I Get A Whoop Whoop?, Friday Foto Fun, TGIFF, Monday Making, Main Crush Monday, Design Wall Monday, Moving it Forward, To-Do Tuesday, Linky Tuesday, Tuesday Colour Linky Party, Midweek Maker, Let's Bee Social, Silly Mama Quilts WIP, Free Motion Mavericks, Needle & Thread Thursday. 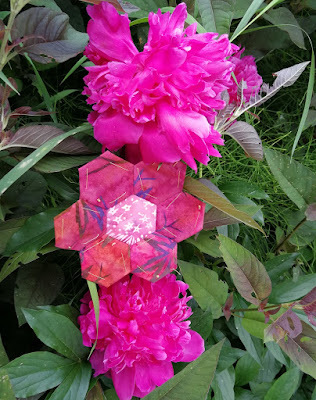 If you follow me on Instagram, you will see how addicted I am to taking photos of my hexie flowers among real flowers. 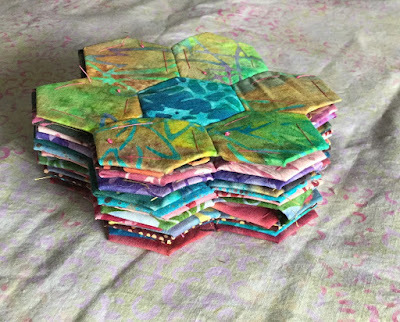 What I like about Instagram is that you can "Like" as many posts as you want without driving your non-quilting friends crazy! I've also been saving the posts that I like so that I can go back to them on my computer and read the corresponding blog posts. Well, in theory I can, and will eventually when I find the time. On my way to work, it made my day to stop in a little park to take pictures of my latest hexie flowers. 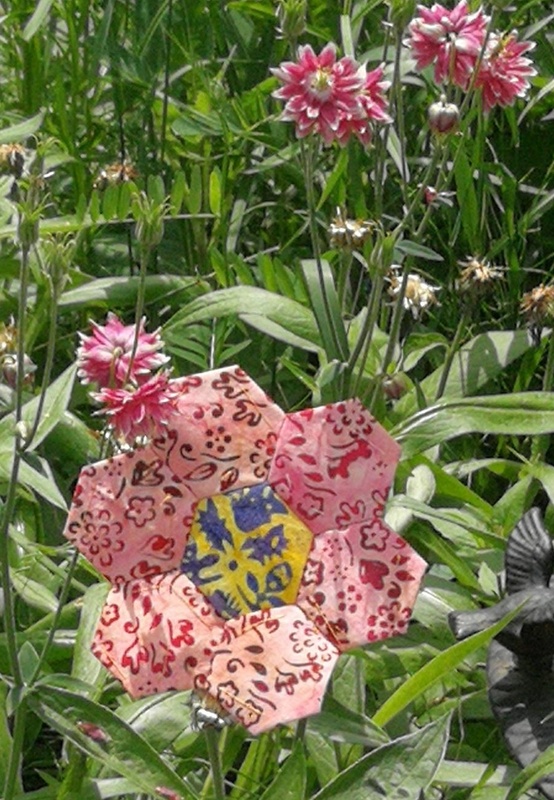 I love the photo below of the dappling sun on the flower and making the fabric even more interesting. That day, I experimented with posting images on Instagram using my computer. I was able to do it, thanks to some helpful googling, but I was only able to post one picture at a time. It's good to know that it can be done. Later I took these pictures in my back yard. This photo is of the last flower of the season on my bleeding heart. It's gotten too hot for these lovelies. 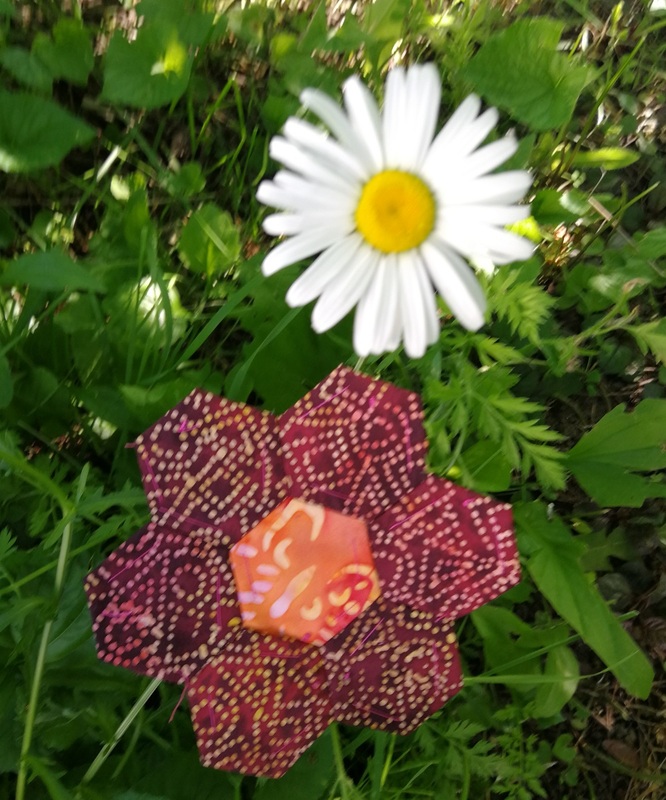 I took a photo with a daisy, the only one growing in the garden. 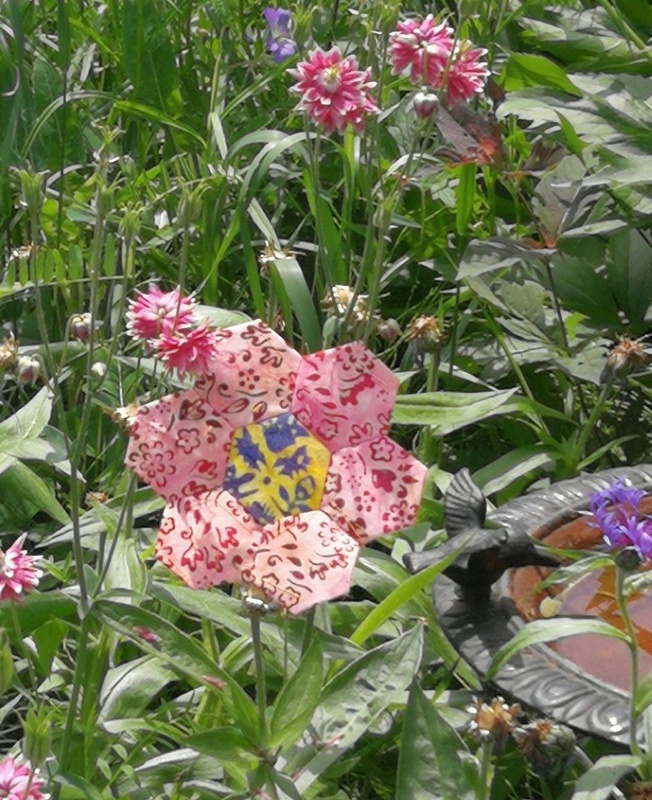 Technically it's probably a weed, but a flower is a flower and I have very few of them left right now. As you can see from some of the pictures, I like to hand-baste my hexies. Actually it's my favourite part, so there's no way I'm going to glue them. That's also the part that's the most portable since you don't have to be as careful about your stitches. I was also able to capture this bee doing its business. Isn't digital photography amazing? You don't have to process all of the images to get that one good shot. You just keep clicking and then delete all the others! This week at the Kingfisher Stitch-Along it's time to cut out the background diamonds. I'm glad that Stitched in Colour created a good tutorial because I could see myself cutting out one diamond at a time. I'm not very good at thinking in 3D. Turns out you can just cut strips and then cut off triangles at both ends. Don't take my word for it, check out the tutorial in the Related Links section. Here is my background fabric. I haven't started cutting it yet. That's a project for this week. 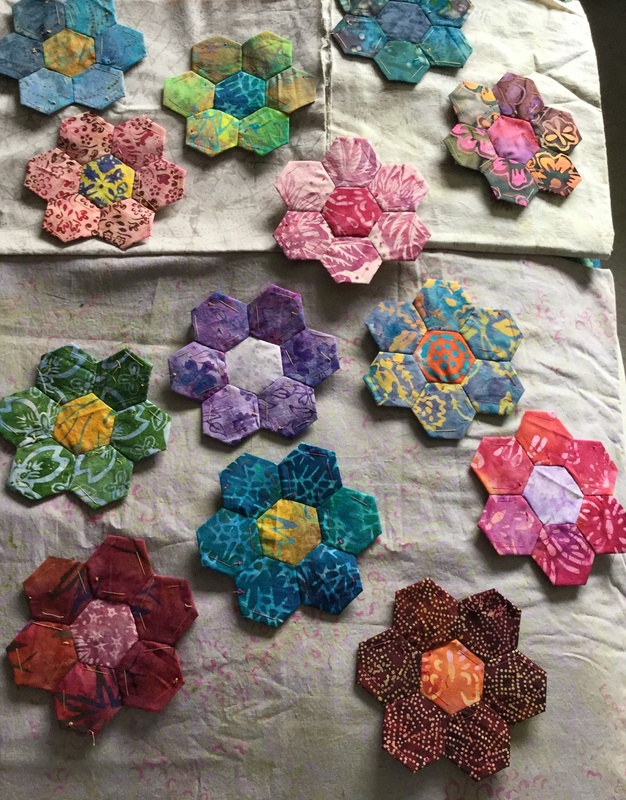 Also, I never cut all of my fabric at one time if I can help it, so there may be time to purchase one or two more light batiks. They aren't easy to find. The background colour isn't that obvious in this picture but it's an off-white with some pink and grey. 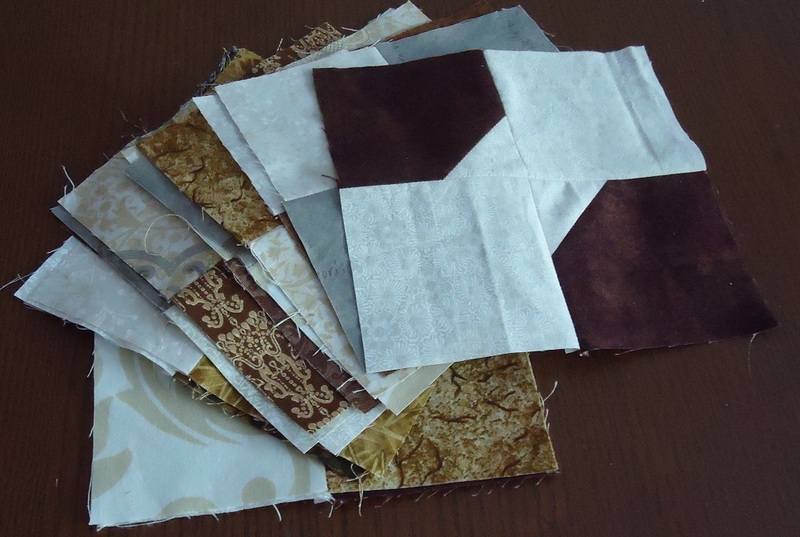 I also have a couple of fat quarters that are off-white with some brown and yellow. Finally here is my stack of hexie flowers to date. There are thirteen in the stack and I am basting 3 more. That's the magic number for my June OMG! I'll be posting in a few days. 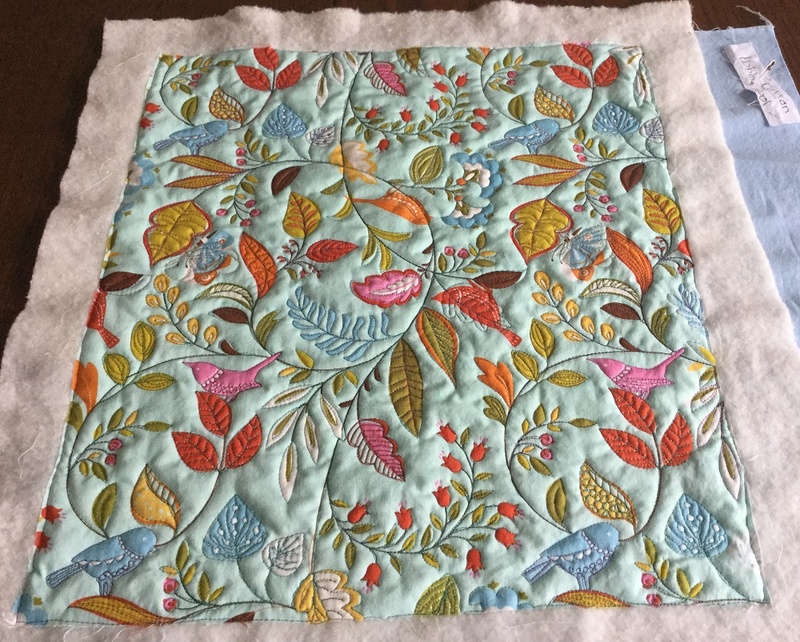 I've really enjoyed all of this slow stitching, but I do miss doing FMQ. 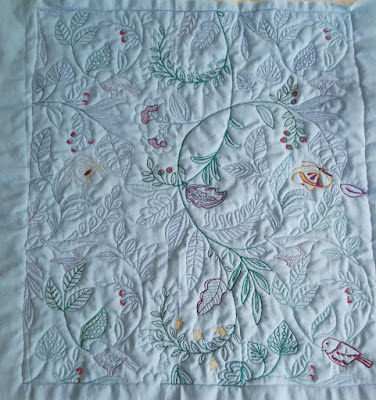 Since I don't want to start a big project, I remembered that I have some thread sketching to do on my second wholecloth quilt from last year's Learning Quilt-A-Long. 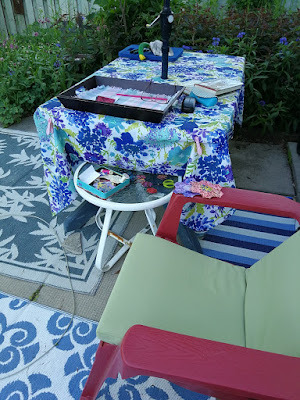 Thread sketching is just FMQ in a very small area and it is good to be doing it again. I love doing the thread painting but it is a very slow process. I am now working on some of the leaves and the strawberries. 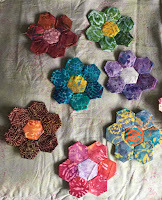 For this project, I am using my collection of Kimono silk thread from Superior Threads. They are truly amazing and such beautiful colours. Details of the wholecloth quilt. It's a very slow process. 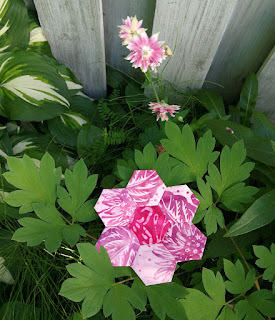 You can probably tell that I'm having fun with my batik hexie flowers. 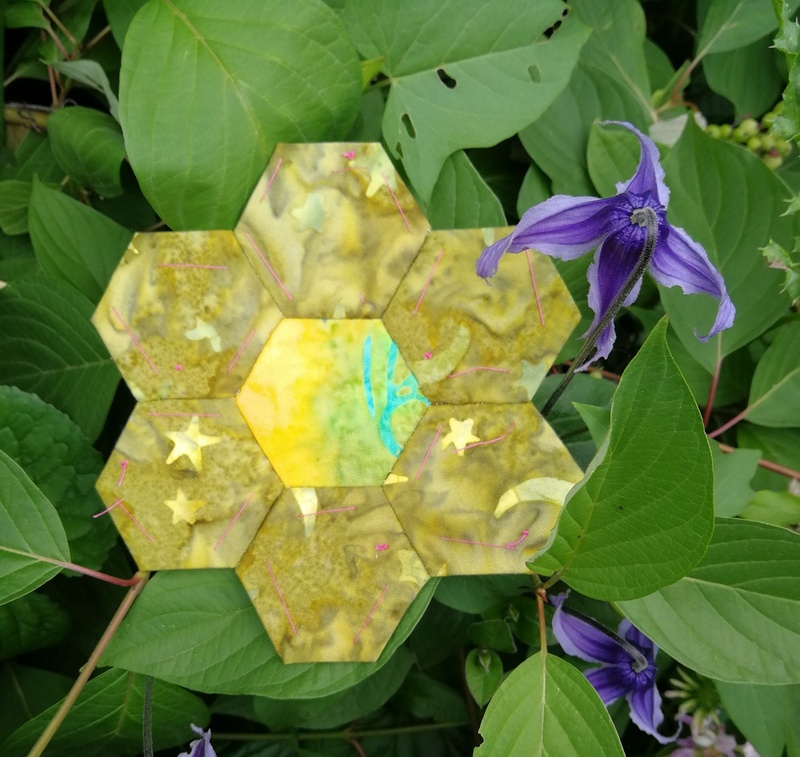 I love batiks, hexies and real flowers, so it's a great combination. It's easier to do the thread painting in daylight. I've found that it's harder on my eyes to be working in the evening, even with the light on. I do want to invest in a second smaller light for this kind of work. I am linking up to many parties this week. Check out what is going on out there in the quilting World. Great News! 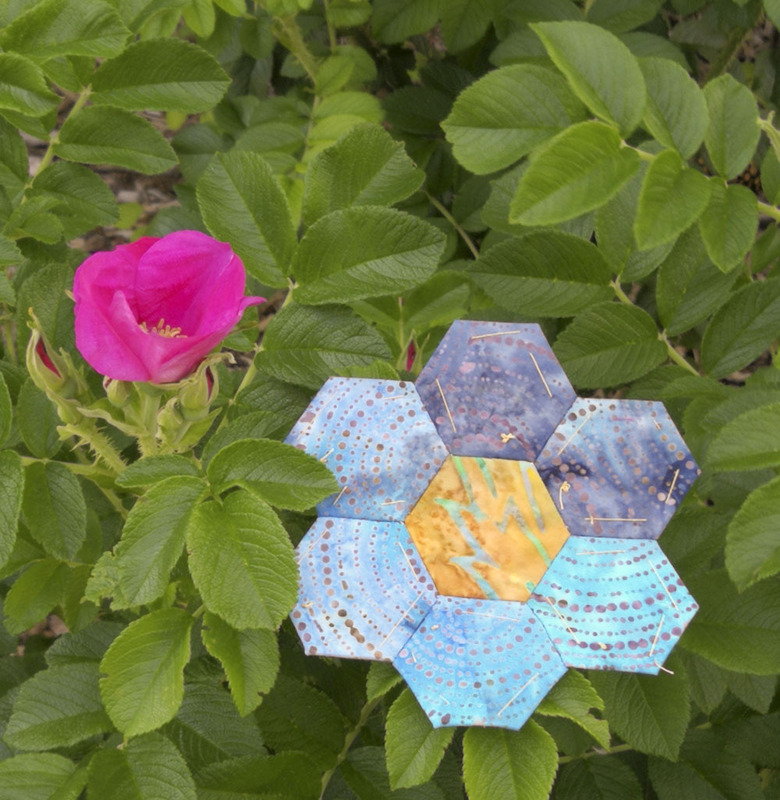 My Wholecloth quilt was featured on Muv's Free Motion Mavericks. Thanks Muv! 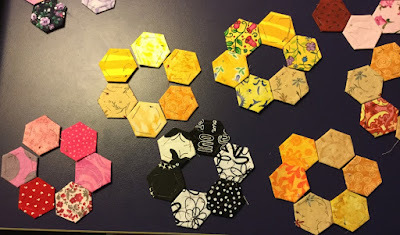 It also turns out that the project is using one inch hexies and the EPP I've done to date are ¾". I was quite happy to take out some new fresh templates that I haven't used. So this week I took out my batik fabrics and found all kinds of lovely, yummy fabrics. 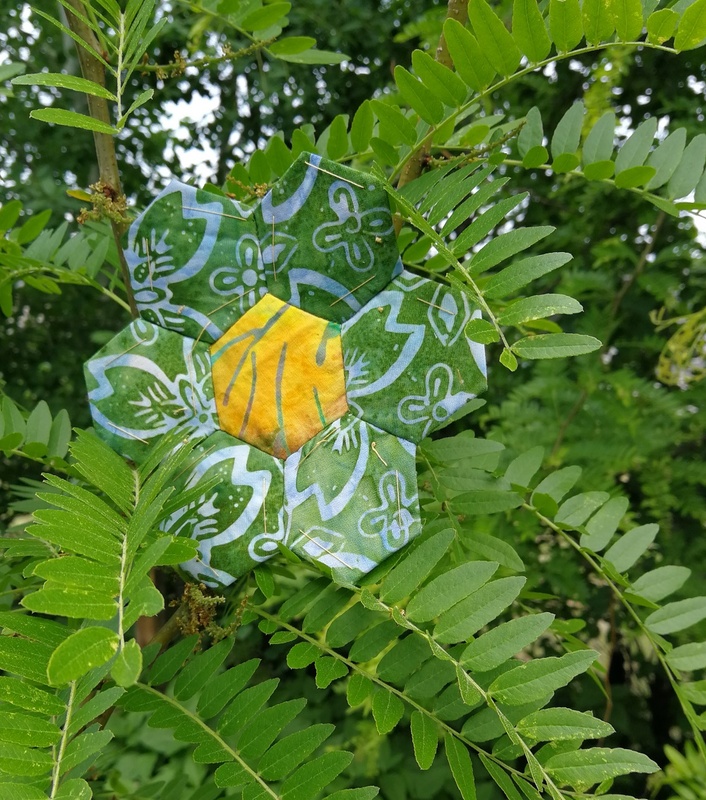 I've decided to make the flower with the same fabric, but a different centre. 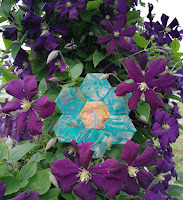 I pieced most of these flowers yesterday, outside in my back yard. It was a little warmer than I prefer, but I've decided to enjoy the summer this year (as much as I can stand it) and not spend it all inside estivating. Here is a gorgeous blue one. 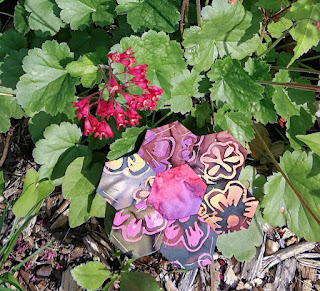 I had a great time finishing these and then finding the perfect spot in the garden to take the picture. I then had to make a green hexie flower since most of the rest of the garden is still very green. This morning I was only able to spend an hour outside - it was just too hot! I finished this flower in the coolness of the house and then took a quick picture outside. My hexie flower pales next to these pink beauties! It would seem that I'm not melting in the heat, so I'm going to try to tough it out a little more. If the garden looks like a jungle behind the plants, it's because it is. Last weekend I was able to do a little bit of weeding, but it was just too hot yesterday. 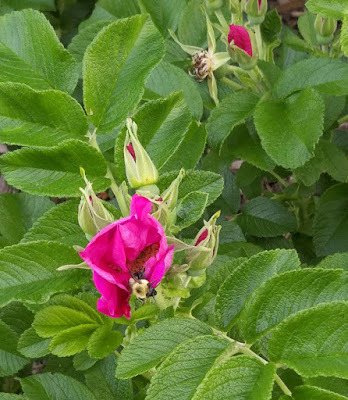 Whatever plants come out in the garden are real fighters and have won the battle against their more fragile neighbours. I love taking these photos. I saw someone do this on the internet and was really impressed. I wish I could give her credit but there is so much stuff out there that it's hard to keep track. Great News! Dione and her Clever Chameleon featured my hexie on her Tuesday Colour Linky Party! 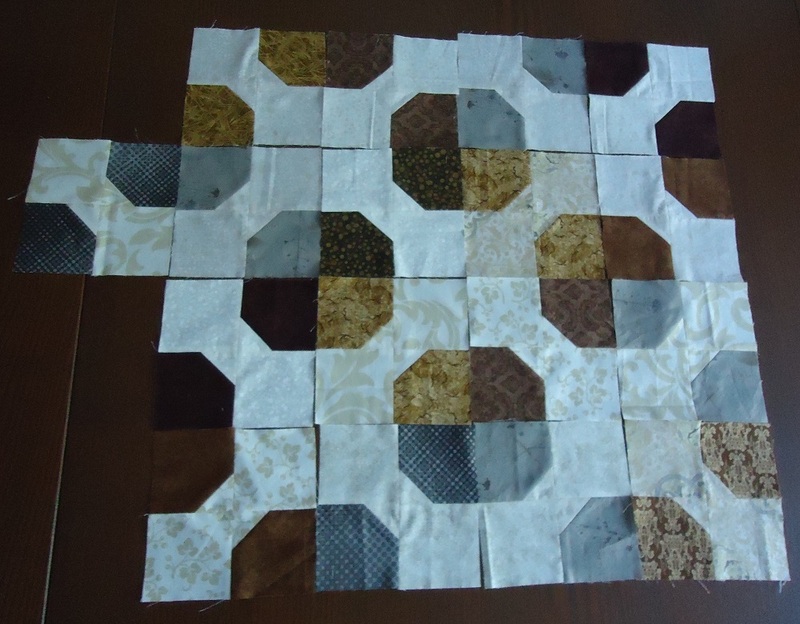 Making neutral quilts is not my favourite thing to make. I generally love working with colour - the more, the brighter, the better! Working without what I perceive as colour is not easy, but I have grown to appreciate the quiet restfulness of neutrals. 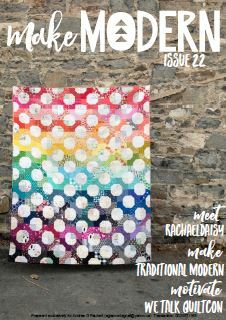 I've been wanting to make a quilt from Make Modern Magazine for a while now. When I saw the Epic Bow Tie Quilt by Jen Van Orman on the cover of the latest Make Modern (Issue 22, May-June 2018), I knew that I was going to make something from that pattern. At first I considered making a runner, but since I have a neutral quilt to make, I wondered how effective this pattern would be in neutrals. At the very least, I knew that it would be different! The pattern is quite simple, which is always what I look for 😊. It's really a take on a snowball block, which I find fascinating for some reason. It may be the act of creating something that looks like a circle but isn't. It took me a while to decide, but I think that a beige background with the circles in medium to dark browns and taupe will make for a lighter looking quilt. 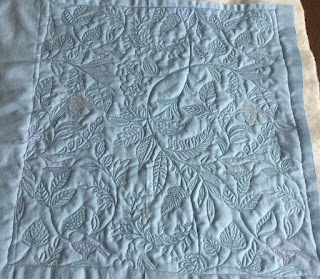 Since people love neutral quilts, I've been accumulating these for a while. I find it fascinating that there are so many different beige prints out there. Something else that I like about this pattern is that I don't have to cut up all the fabric at once. That is a definite bonus! Here it is so far. This quilt is really coming along well and is perfect for when some relatively mindless stitching is all I can handle. I'm really liking it so far! 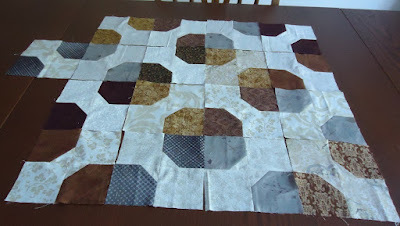 This quilt really suits my quilt making process - cut a few fabrics, make a few blocks, try them out and repeat. This process often brings about surprises because as I cut up different fabrics, the look of the quilt changes. The light background should also be more fun to FMQ since I can mark it without effort, if that's what I decide to do. 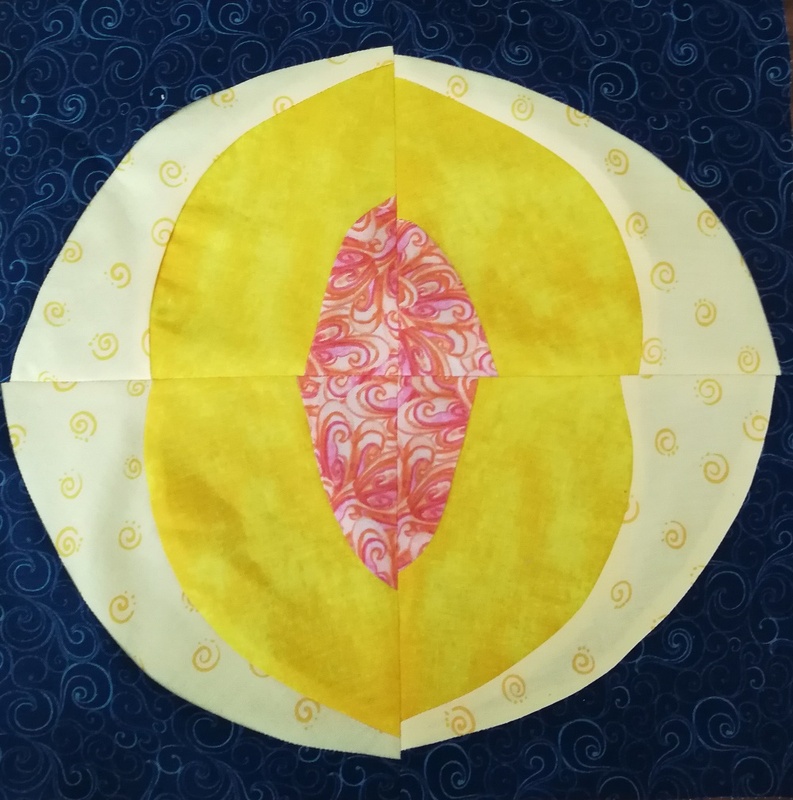 I remembered that lesson from my last neutral quilt. I'll be linking this post to a whole bunch of parties! Join us 😊 Moving it Forward, Design Wall Monday, Main Crush Monday, Monday Making, Linky Tuesday, Tuesday Colour Linky Party, Let's Bee Social, Midweek Makers, Needle & Thread Thursday, Finished or Not Friday, Can I Get A Whoop Whoop?, Friday Foto Fun. Great News! 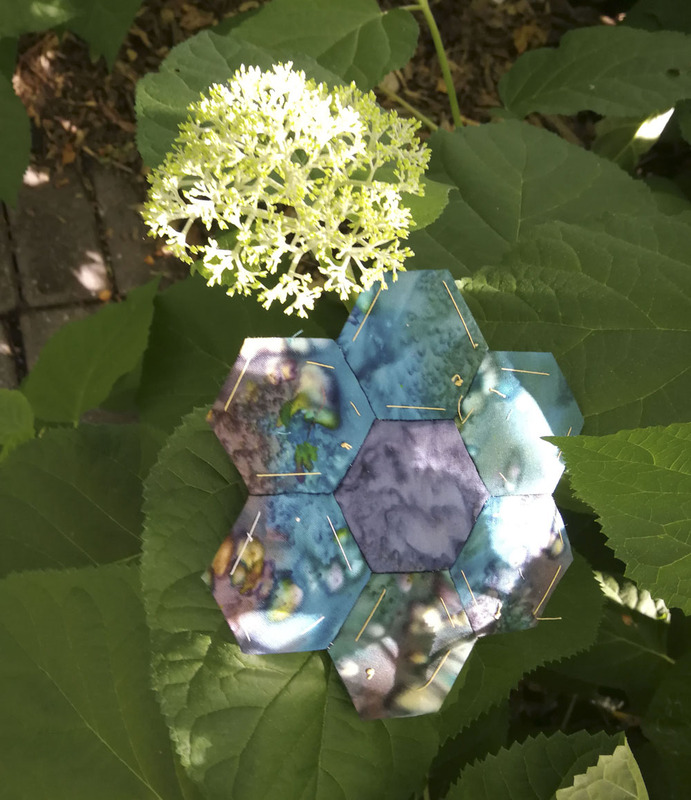 I was featured on the Clever Chameleon. Make sure that you visit Dione's blog. She's doing some great stuff with colour!....and even appreciates neutrals 😊. My life is overflowing with quilting, embroider, EPP and other fibre art projects. I love it, especially since there are no real deadlines. Here are some of the things I've been working on this week. The Out of the Box FibreArtist group has a challenge so that we can eventually create a body of art for an exhibition. It's really weird working on a piece for eventually. It's also really nice since I get to explore without a deadline. I'm only going to show you elements of it since it's got a long way to go. Eventually the task will be to make sure that it's cohesive. The first image is a layered circle. 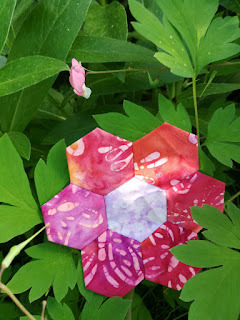 I started with a circle of hand-dyed fabric cut with pinking shears. 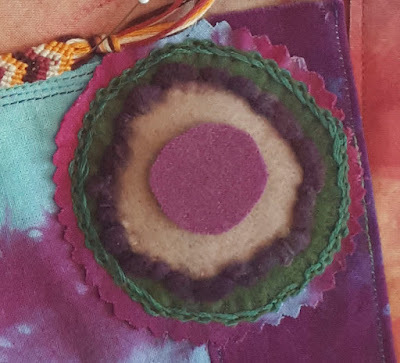 I layered the circle and embroidering it following some of Sue Spargo's techniques from her Craftsy class, Embroidery Texture & Dimension by Hand. The layer on top of the fabric is green pre-felted wool, attached with a whip stitch. 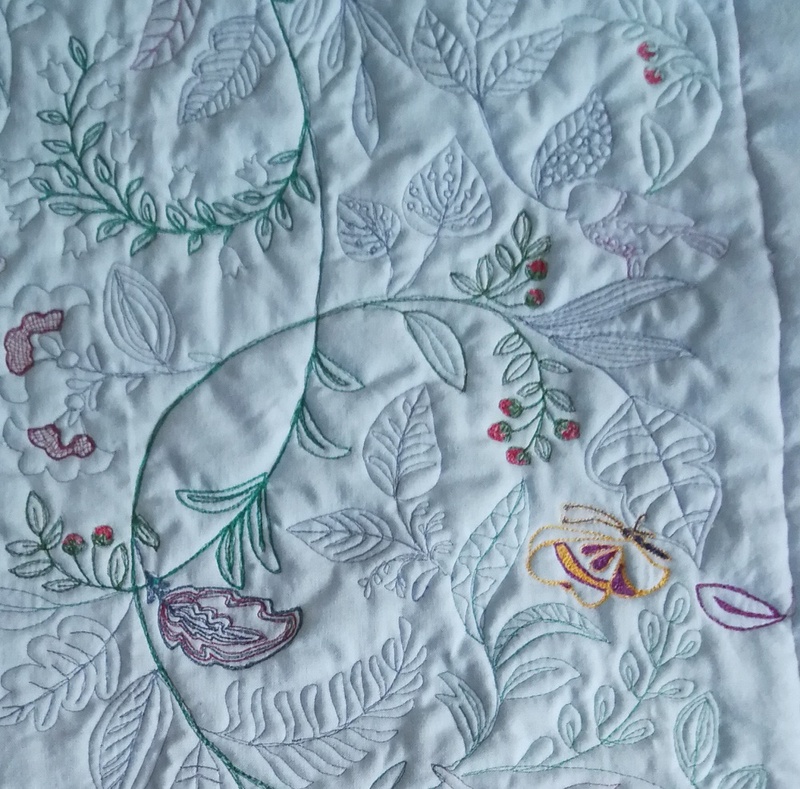 This layer is surrounded by Pekinese stitches in 2 shades of green embroidery floss. The next layer, a pink-beige pre-felted wool, is crowned with couched purple sheep curls. I haven't figured out what will go with the next purple felted circle. I have a 3-D edge that needed to be finished. Over the zigzag stitch I attached little strips of cheesecloth on both sides of the edge. Over this I needle felted some lovely wool roving. In this area, I cut some of the dyed fabric into strips and wove it together into a block. I didn't want to add the whole block so I backed it with fusible web, cut it into this shape and then stitched it to the background. Eventually I will be stitching around it. 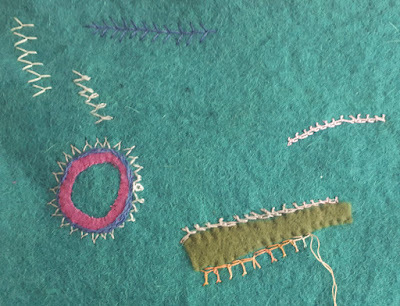 I also practiced some of the stitches I learned on this piece of felt. 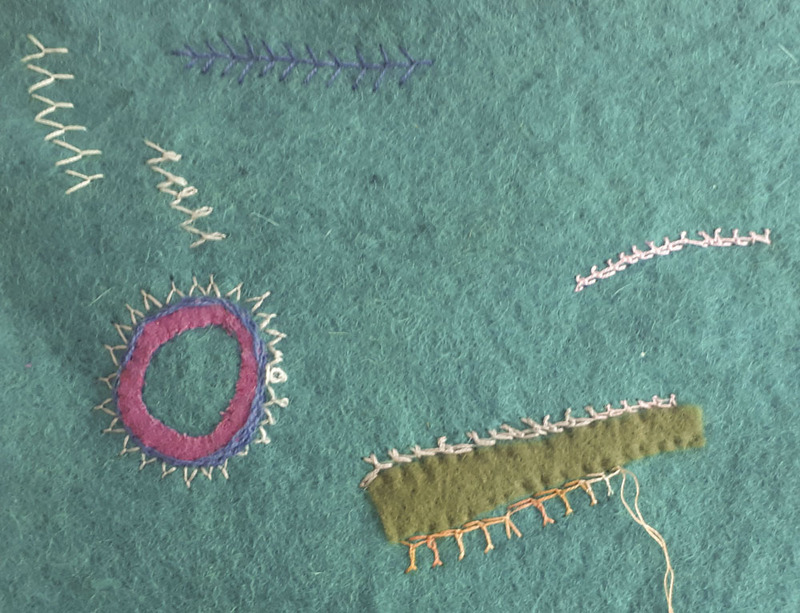 There are fly stitches, tête de boeuf, closed fly stitches, more Pekinese stitches and attempts at a few crested chains. The stitch along has started. 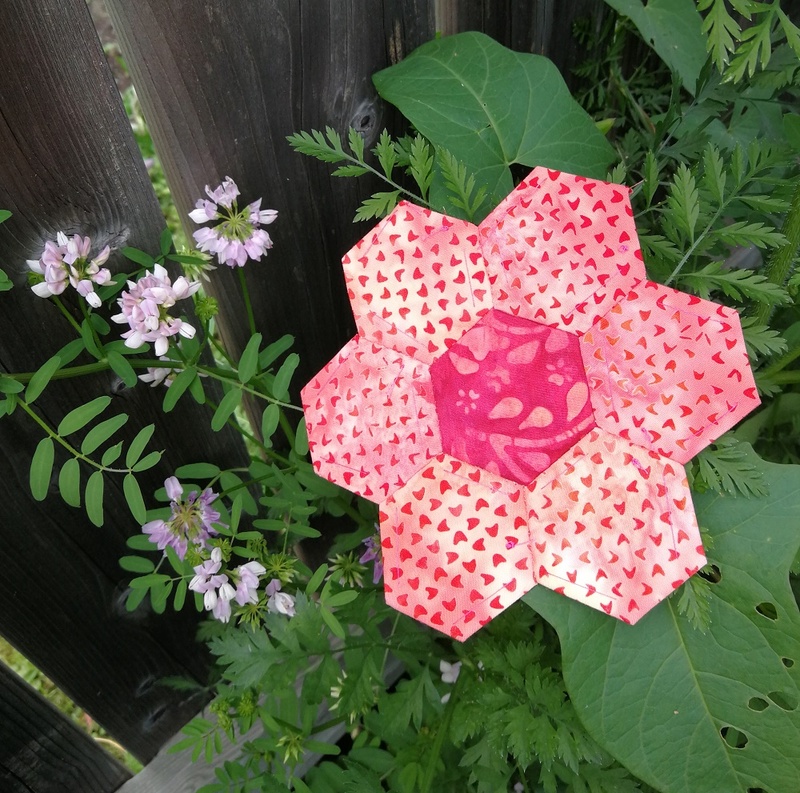 I thought I had a few EPP flowers already made but my hexies had two rows while the pattern calls for only one row of hexies around the middle hexie. I'm not complaining since in the end it will be that much easier and faster to make. These are potential flowers from my pile of already made hexies. The next step is to go into the stash and get different fabric, since these are the ones that I've been working with for the last year. Time for some new stuff! As you can guess, I haven't decided what to do about the middle hexie. 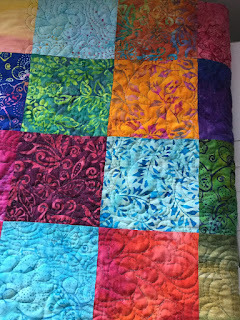 I would like it to be roughly the same fabric or colour to unify the quilt. This project will be my One Monthly Goal (OMG) for June. We are supposed to make 8 flowers per week. I'm not sure that's very realistic for me, so I'm aiming for 16 flowers by the end of June. I'm not really sure where I'm going with this art piece but ultimately what I would like is to make a cohesive piece that includes all kinds of different techniques that I'm learning. I started with some improv piecing, didn't like parts of it so I just took the rotary cutter to it! I have a few ideas but what I'm trying to figure out is when to quilt it. 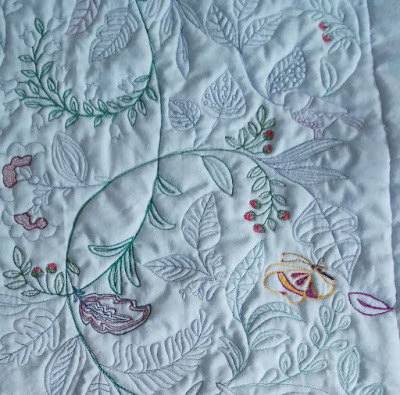 Since I want to add some found objects and do some beading, the quilting should probably be done before this. I am loving the creative process and really trying to let myself be ok with not knowing how it's going to turn out. I'm just doing a minimum of planning as I go. I've been known to do this but it doesn't always work out. This time, it will! I'm glad that the EPP project involves lots of colour because my art quilt isn't as colourful as I would like.